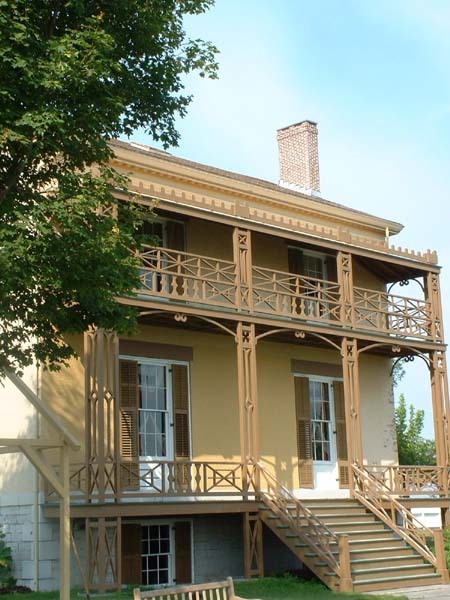 One of the historic homes in Sacketts Harbor, where two important battles of the War of 1812 were fought. Historic Tibbits Lighthouse sits at the entrance to the St. Lawrence River near Cape Vincent. 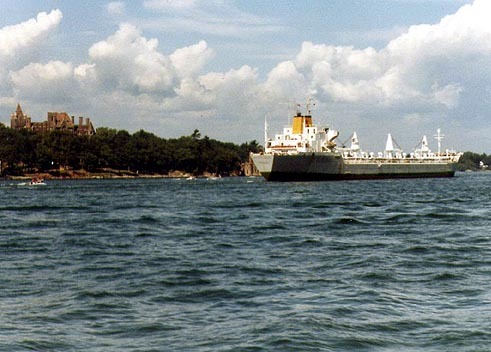 Boldt Castle is one of the most popular places in the Thousand Islands. It is visible from the mainland, but it can be visited by taking a boat tour out of Alexandria Bay. These two small islands are on the international boundary between the US and Canada. A small footbridge spans the border. 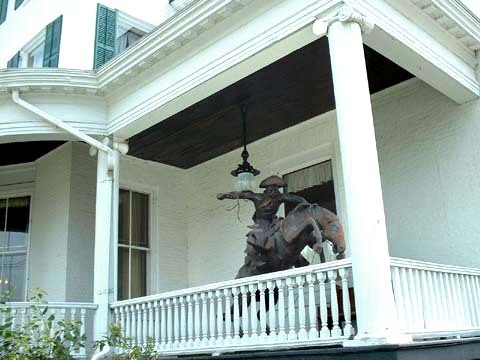 The home of western artist Frederick Remington is in Ogdensburg. It is now a museum about his life and his art. 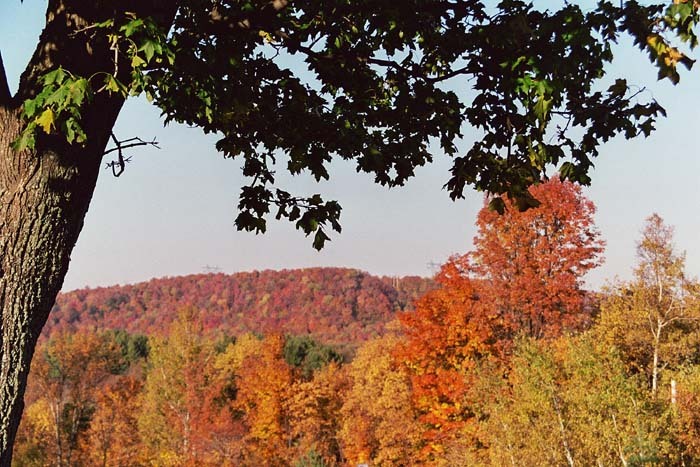 The road heading south toward Harrisville skirts the edges of the Adirondacks, and they really show their beauty in full fall foliage. the foothills of the Adirondacks. 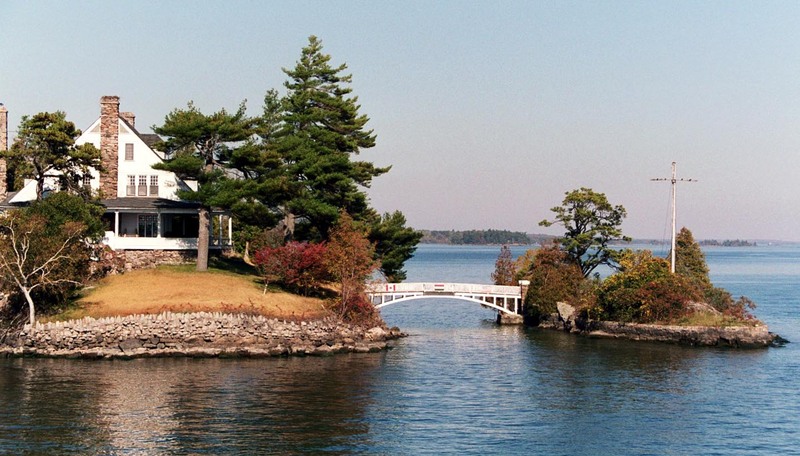 The Thousand Islands (actually around 1700) are rocky outcrops of the ancient Canadian Shield that poke through the St. Lawrence River. 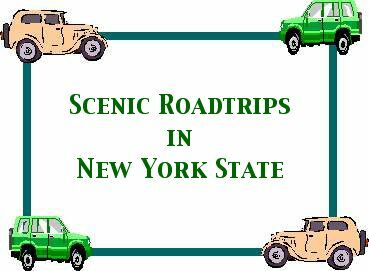 This road trip follows the river itself, part of the shoreline of Lake Ontario, and the loop finishes in the foothills of the Adirondacks. 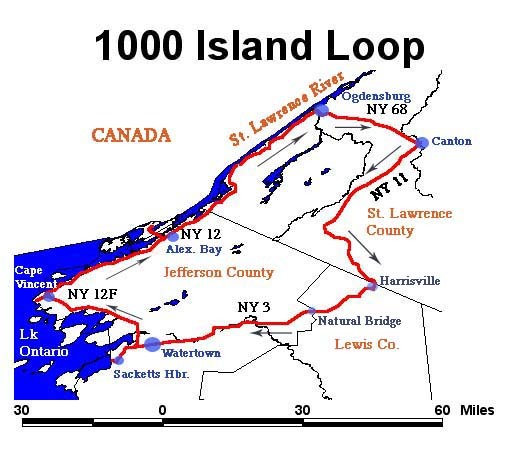 You will see ocean vessels negotiating their way through the St. Lawrence Seaway on their way to a Great Lake port. When in Alexandria Bay you can jump on a tour boat that takes you to islands owned by millionaires of the Gilded Age. You will experience the history of the War of 1812 in Sacketts Harbor and the art of Frederick Remington in Ogdensburg. The trip back along the Black River is scenic in its own right. Let's the road...and the water, too! Start your road trip at Watertown's Thompson Park, a nice place to get your bearings. Take Route 3 west out of the city and visit the historic village of Sackett's Harbor. Two naval and land battles were fought here in the War of 1812. Start back toward Watertown, but stay on the Seaway Trail (Rte. 180). You cross the Black River in Dexter. Take Rte. 12F into the gateway village of Cape Vincent. 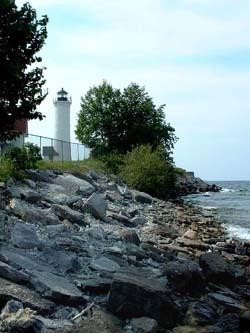 About three miles west is the beautiful Tibbits Lighthouse at the entrance to the St. Lawrence River. 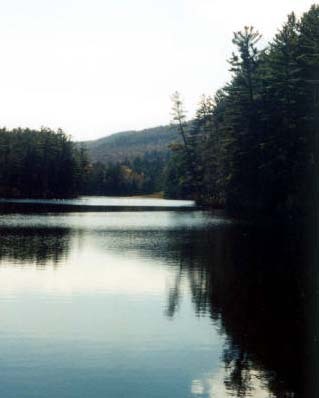 Much of the land along the river is privately owned but there are many state parks to enjoy along Routes 12 E and 12. 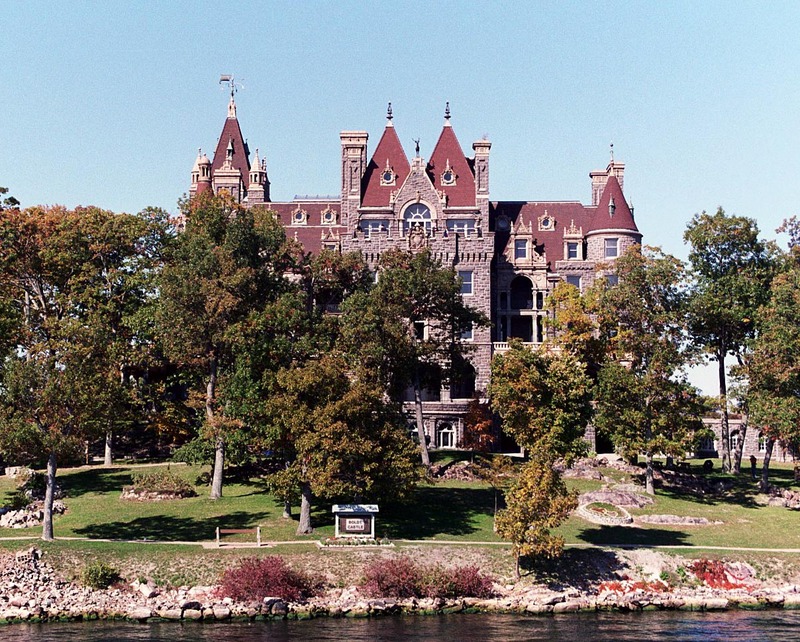 The village of Clayton has an antique boat museum, and Alexandria Bay hosts boat tours through the islands, including a stop at Boldt Castle. 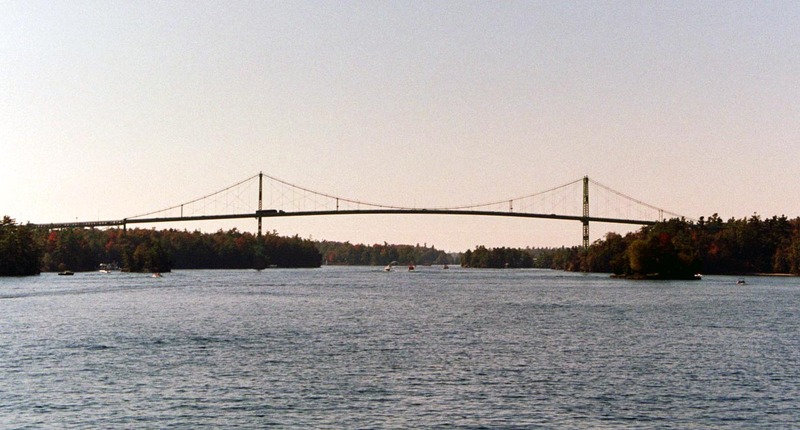 A nice side trip is to take the Thousand Island Bridge (see photo on the left) to Wellsley Island, a nice place for a picnic and a swim. 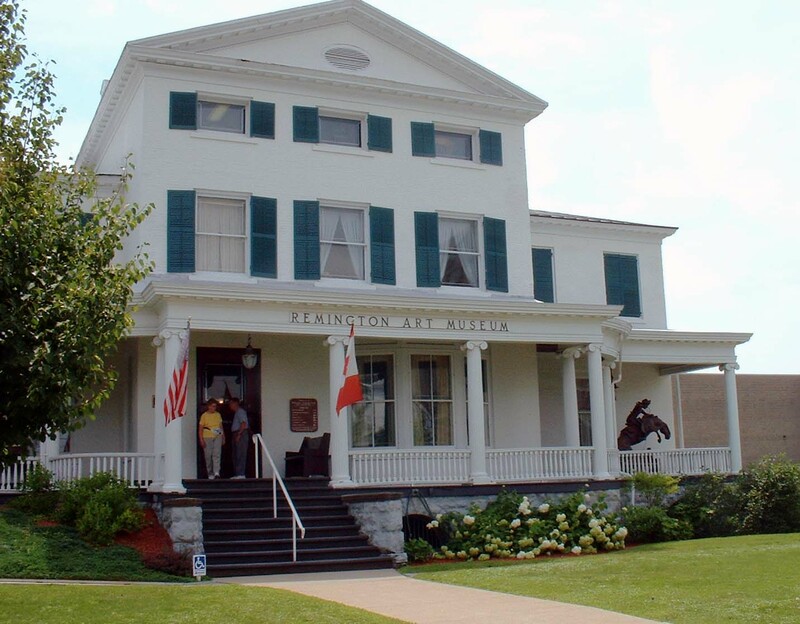 You should make your next stop in Ogdensburg, and visit the Frederick Remington Museum. They have a great collection of western art painted and sculpted by Remington, a native son. For the return trip, you leave the river, following Route 68 south to Canton. This is the home to St. Lawrence University. Pick up Route 11 and drive southwesterward to the village of Gouverneur. Turn left onto Routes 58/812. You will soon notice that the land is getting more rocky with fewer farms. You are in the foothills of the Adirondacks. At Fowler, take Rte. 812 south to Harrisville, on the very edge of the Adirondack Park. Here, the Oswegatchie River (pictured at the left) spills over some beautiful little waterfalls. 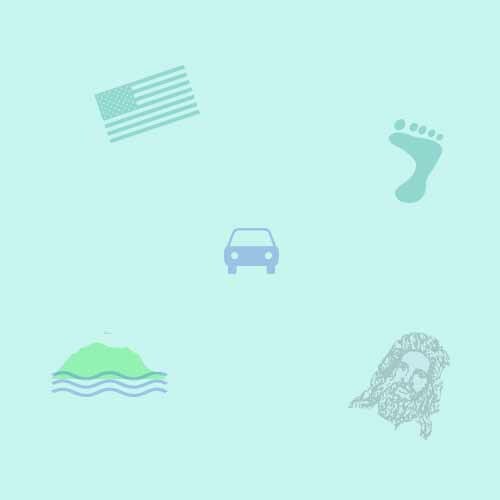 Route 3 takes you home, following the Black River. One interesting last stop is Natural Bridge, an interesting rock formation near the village of the same name. You may notice a lot of new construction on the final leg. This is due to the expansion of Fort Drum, which borders Route 3.